What Do You Want To Know About The 2018 Porsche Panamera Turbo Sport Turismo? We are in an unexpected golden age of wagons. This year alone, your hardworking Jalopnik staff has tested wagons from Volvo, Buick, Mercedes and Jaguar. Wagons are having a bit of a moment thanks to the crossover boom and how Americans are going nuts over anything with a hatch. But now we find ourselves in what may be the wagon apex predator: the Porsche Panamera Sport Turismo. You may recall that we’re currently on the second-generation Panamera, and the first ever good-looking one. Well last time, Porsche flirted with a wagon concept but never actually brought it production. For this iteration of the Panamera, it finally happened, and it is for sale in America. The one you see here is not just any Panamera, either: it is a Panamera Turbo. This wagon has a 4.0-liter twin-turbo V8 pumping out 550 horsepower. Zero to 60 mph happens in 3.4 seconds with launch control, top speed is 188 mph, power goes to all four wheels via an eight-speed PDK, and it’s got up to 49 cubic feet of luggage volume. Yes, I am looking forward to driving it. Yet notice I said it “may” be the best. The only thing that can come close to the Panamera wagon is the Mercedes-AMG E63 S wagon, which has more than 50 more horses but offers similar performance stats. 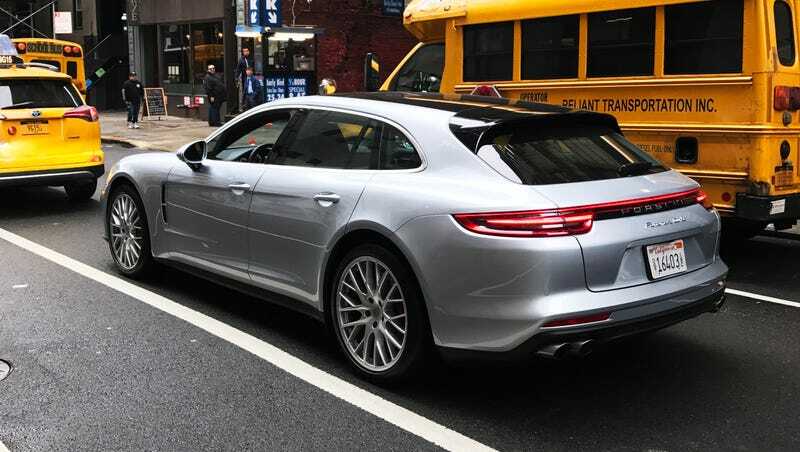 And as much as I love the current E-Class, having also driven the Panamera sedan, I think Porsche’s wagon has a shot at being better. None of this comes cheap. The Panamera Turbo Sport Turismo starts at $154,000, and this car’s options bring it up to $175,170, making it easily one of the more expensive cars we’ve tested in a while. The Panamera wagon with its new friend.